1. Why Spark, even Hadoop exists? Ans: Below are few reasons. · Iterative Algorithm: Generally MapReduce is not good to process iterative algorithms like Machine Learning and Graph processing. Graph and Machine Learning algorithms are iterative by nature and less saves to disk, this type of algorithm needs data in memory to run algorithm steps again and again or less transfers over network means better performance. · In Memory Processing: MapReduce uses disk storage for storing processed intermediate data and also read from disks which is not good for fast processing. . Because Spark keeps data in Memory (Configurable), which saves lot of time, by not reading and writing data to disk as it happens in case of Hadoop. · Near real-time data processing: Spark also supports near real-time streaming workloads via Spark Streaming application framework. 2. Why both Spark and Hadoop needed? Ans: Spark is often called cluster computing engine or simply execution engine. 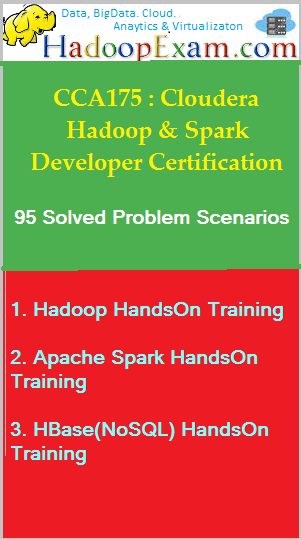 Spark uses many concepts from Hadoop MapReduce. Both Spark and Hadoop work together well. Spark with HDFS and YARN gives better performance and also simplifies the work distribution on cluster. As HDFS is storage engine for storing huge volume of data and Spark as a processing engine (In memory as well as more efficient data processing). 3. How can you use Machine Learning library “SciKit library” which is written in Python, with Spark engine? Ans: Machine learning tool written in Python, e.g. SciKit library, can be used as a Pipeline API in Spark MLlib or calling pipe(). 4. Why Spark is good at low-latency iterative workloads e.g. Graphs and Machine Learning? Ans: Machine Learning algorithms for instance logistic regression require many iterations before creating optimal resulting model. And similarly in graph algorithms which traverse all the nodes and edges. Any algorithm which needs many iteration before creating results can increase their performance when the intermediate partial results are stored in memory or at very fast solid state drives. 5. Which all kind of data processing supported by Spark? Ans: Spark offers three kinds of data processing using batch, interactive (Spark Shell), and stream processing with the unified API and data structures. 6. How do you define SparkContext? Ans: It’s an entry point for a Spark Job. Each Spark application starts by instantiating a Spark context. A Spark application is an instance of SparkContext. Or you can say, a Spark context constitutes a Spark application. SparkContext represents the connection to a Spark execution environment (deployment mode). A Spark context can be used to create RDDs, accumulators and broadcast variables, access Spark services and run jobs. A Spark context is essentially a client of Spark’s execution environment and it acts as the master of your Spark. 7. How can you define SparkConf? 8. Which all are the, ways to configure Spark Properties and order them least important to the most important. 9. What is the Default level of parallelism in Spark? Ans: Default level of parallelism is the number of partitions when not specified explicitly by a user. 10. Is it possible to have multiple SparkContext in single JVM? Ans: Yes, spark.driver.allowMultipleContexts is true (default: false ). If true Spark logs warnings instead of throwing exceptions when multiple SparkContexts are active, i.e. multiple SparkContext are running in this JVM. When creating an instance of SparkContex.